Hey readers! We’re coming back at it this week on Hillsborough St. with Oishi! Oishi is a fantastic Japanese restaurant among other buildings that make up the Electric Co Mall. It sits right across the street from DH Hill Library at NC State, but doesn't get much love because it’s close to the construction site of future convenience stores and restaurants. 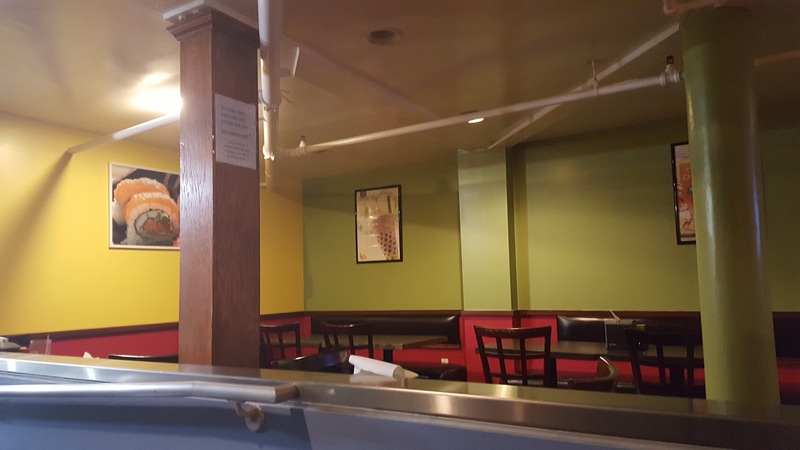 When I first walked in, I was immediately greeted by a waitress who asked where I wanted to sit. To my right was a seating area with a bar at the front window, for those who want a view or lunch in solitude. I actually got a seat down the corridor. When I sat down, I noticed that I couldn't hear the construction outside; noise was not an issue here. I was given a menu and had a perusal of the items on it. Oishi actually has lunch and dinner sushi BOGO specials so it’s definitely worth checking out for that! For my lunch, I chose a BOGO sushi special, with the Firecracker and the Red Dragon Roll. I also chose a green tea flavored bubble tea as my drink. 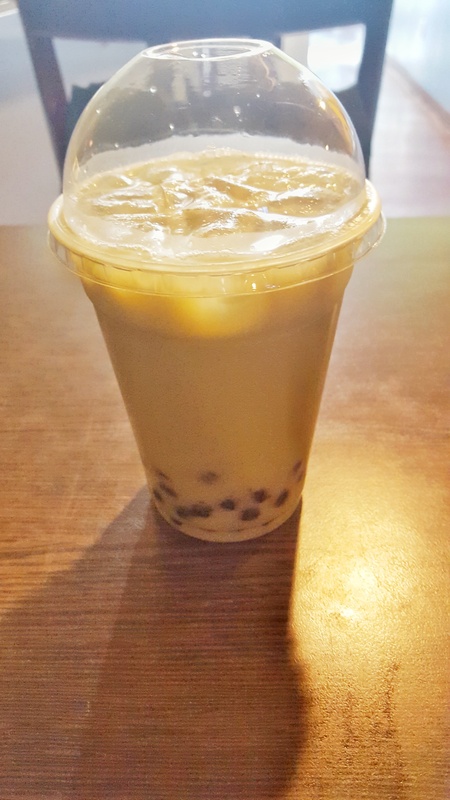 As a side note, Oishi is one of few restaurants on Hillsborough Street that serves bubble tea, and they have a variety of traditional and creative flavors to try! 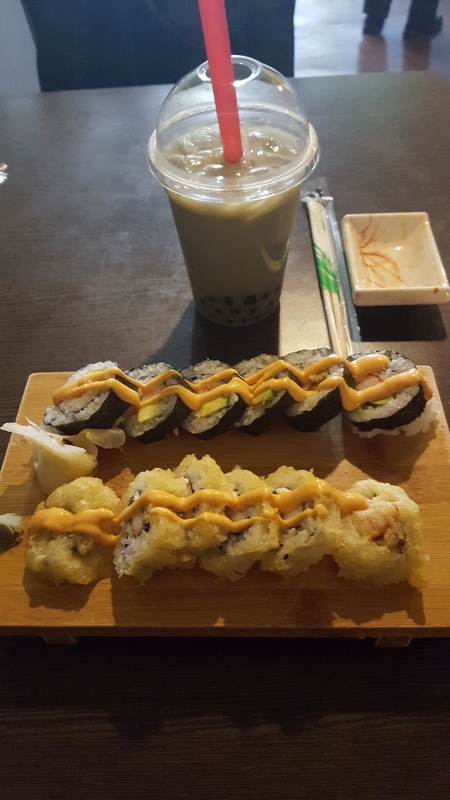 The bubble tea quickly came out to me and the sushi was served not long after that. The sushi was fresh and placed on a wooden sushi board with ginger and wasabi. I like to put my wasabi in my soy sauce and my ginger on the sushi pieces. This really isn’t the correct way to eat sushi, but it’s to your discretion how you'd like to eat it. There were many other popular items on the menu to try, such as the hibachi chicken, beef, or seafood, the tuna tataki, and a page of traditional Chinese dishes. These items are some of what attracts customers to the restaurant. If you’re looking for an affordable but delicious sushi restaurant that’s close by, definitely check out Oishi! 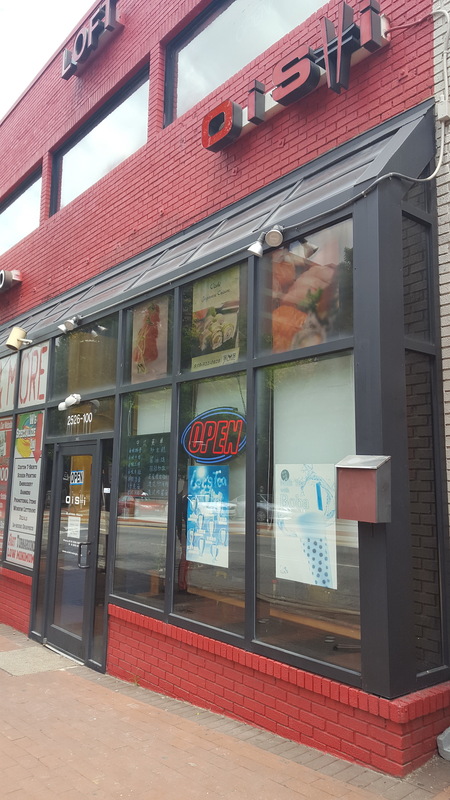 They have a few other Asian dishes, and they’re a few doors down from Freshberry on the corner of Pogue and Hillsborough. There! I’ve planned your dinner and dessert! Stop by Oishi today!